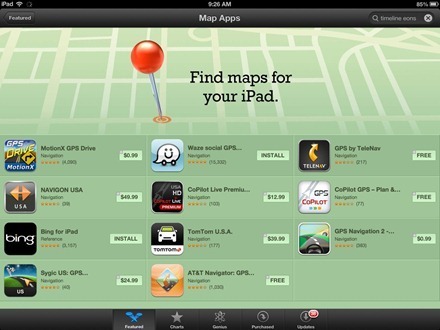 One of the topical app collections this week in the iPad App Store is Find maps for your iPad – which offers a selection of maps apps (say that 10 times fast) for the iPad. The section highlights apps from some of the leading navigation app publishers, including Navigon, TomTom, Waze, and more. I’m sure that highlighting this particular apps collection has nothing at all to do with the widespread dissatisfaction with Apple’s new Maps app in iOS 6 – but if you’ve updated to iOS 6 and would like more choices for maps software it’s not a bad starting point. I’ve had the Mapquest app on my iPad for a long while now and it has served me well on several long-ish trips. It’s an iPhone app that’s not yet universal, but it still works well on the iPad, and offers turn-by-turn navigation too. You can find the Find maps for your iPad collection just below the New and Noteworthy section of the Featured area in the iPad App Store. For those of you who have updated to iOS 6, which maps apps are you using? I’ve being using Waze, such a good app! First, it has live report, with live traffic report and so on. Second, it has many search engine, so you will find the address of the places you want to go easily. Third, it can connect to my Bluetooth in the car so I get the turn by turn instructions come from my audio, besides I can just wave the screen and communicate with the map to report if there’s car accident, traffic jam, and so on. Such a good app and it’s for free. I think this one is far better than google map and apple map, maybe not as accurate as google but it’s so user friendly. Drawback is: use a lot of data and power. I think and hope that the Apple should buy this app and make it their default map.